The impact-echo technique is based on the use of transient stress waves for non-destructive detection of flaws in concrete structures. Impact-echo testing has been carried out for assessment of the structural integrity of the ring beam of a pressurized heavy water nuclear reactor (PHWR). In order to develop the test procedure for carrying out Impact echo testing, mock up calibration blocks were made. The detectability of the Impact-echo system has also been established in terms of the depth and the lateral dimension of the detectable flaw. Based on the optimized test parameters identified with the help of the studies carried out on the mock up blocks, impact echo testing was carried out on the ring beam of the reactor containment structure, for assessing its structural integrity. Critical concrete structures need to be evaluated in the as fabricated condition to ensure that they are free from defects and also during their service to verify that they have not deteriorated and are free from defects. Ultrasonic and impact-echo test methods are two important methods that are widely used for the nondestructive examination of concrete structures (Anish kumar et al., 1998, 1999). Testing of thick concrete structures using ultrasonic technique is often difficult due to heavy scattering and attenuation of the sound energy in the medium and the resultant poor signal-to-noise ratio of the reflected signal amplitudes. Also, in thick structures, ultrasonic through transmission technique is suggested. This needs accessibility of both surfaces as well as proper alignment of both transducers, which is quite difficult if not impossible. To overcome these limitations and to reliably examine the concrete structures, impact-echo test method was developed in the mid 1980's as a nondestructive test method (Sansalone, 1996). Containment structures of some of the pressurized heavy water reactors (PHWRs) are made of prestressed concrete with pretensioned cables. One of the important components of this containment structure is the ring beam. The inner containment dome of one of the CANDU type PHWRs got delaminated during construction. Due to sudden release of force in prestressing cables during collapse of the dome and during subsequent detensioning/slackening of the cables, delamination in ring beam was suspected. Impact echo testing has been carried out for assessment of the structural integrity of the ring beam. In this paper, impact echo technique based procedure for inspection of such containment structure by systematic mock up studies is discussed. A part of one of the mock up blocks used for developing the procedure simulates the ring beam and rest of this block is a typical reinforced concrete structure with simulated defects such as voids, delaminations of reinforced rods, surface cracks etc. The feasibility of detecting various types of flaws, viz. voids, delamination at reinforced rods, surface opening cracks etc. and various interfaces such as reinforced rods, ducts etc., in concrete structures using Impact-echo technique is discussed in this paper. The Impact-echo testing has also been carried out for the measurement of the depth of surface opening cracks. The delectability of the Impact-echo system is also established in terms of the depth and the lateral dimension of the defect. Based on the optimized test parameters identified with the help of studies carried out on the mock up blocks, impact echo testing was carried out on the ring beam of the reactor containment structure, for assessing its structural integrity. The Impact Echo test system, made of Germann Instruments A/S, Denmark, was used to carry out the testings. The schematic of the setup of the system is shown in Fig. 1.
a software program that monitors each test, and guides the data processing to produce output displays viz., time signal, frequency spectrum, frequency amplitude as a function of % depth, that provide information about the structure being tested. Fig 2: (a) Experimental setup and (b) signal acquired for ultrasonic velocity measurement using Impact echo technique. Figure 2 shows the experimental setup and signal acquired for ultrasonic velocity measurement. The difference in the arrival time of R-waves at two transducers can be measured by moving the cursors (Fig. 2b). The distance between the two transducers is kept constant (300 mm). The R-wave velocity (CR) can be calculated from this and P-wave velocity (CP) can be determined using equation-1. where n is the poission's ratio. The calculated P-wave velocity on the mock up block is 3950± 100 m/s. Mock-up block-I of size 4000 x 4335 mm (Fig. 3a), representing a circumferential length equivalent to about 4 degrees of the ring beam, containing simulated flaws (voids of sizes 50, 100 and 200 mm at the depth of 500 mm), reinforced bars (of diameter 20, 32 and 45 mm at the depth of 50 mm, with and without delaminations), surface opening cracks (of 25, 50 and 75 mm depth), etc. and block-II of size 600 x 600 x 1200 mm containing 50 mm voids at various depths (100 mm, 200 mm and 300 mm) and 80 mm diameter sheath at various depths were prepared. Fig 3: (a) Photograph and (b) Impact echo response of full thickness of mock up block-1. Figure 3b shows the full thickness response (time and frequency domain) of block-I of thickness 1500 mm. A 10 mm diameter hardened steel ball was used for giving impact. The low digitising frequency (250 kHz) and the longest data length (2048) was selected to increase the resolution in frequency domain (0.12 kHz) and hence in distance measurement at larger depth (~145 mm at the depth of 1500 mm). The frequency response of the test showed a dominant peak at 1.2 kHz corresponding to the depth of 1618 mm. The deviation of the measured thickness from actual thickness is 118 mm, which is within the resolution limit at that thickness (145 mm at the depth of 1500 mm), as discussed above. Where D and t are diameter and depth of the reinforcement rod respectively. Putting the value of D and t in equation (2) gives the actual depth as 52 mm which is very close to the actual depth of the rod. Impact-echo testing carried out on reinforced rods of various diameters at different depths revealed that the reinforced rod can be detected by impact-echo testing if the ratio of the depth of location to the diameter of the reinforced rod is less than 3. Figure 4(b) shows the response of a delaminated rod of diameter 45 mm at the depth of 35 mm. The frequency spectrum shows the dominant peaks at 6.3 kHz and 59.6 kHz (33 mm). The peak at 59.6 kHz is due to the reflection from concrete/air interface at the depth of 35 mm (delamination) and the peak at 6.3 kHz corresponds to the flexural vibration of the concrete cover of 35 mm thickness. This is a typical response, if the section above the delamination is thin (less than 60 mm) (Chia-Chi Chang and Mary Samsalone, 1993). Hence, it is clear from the response of the reinforcement rod (with and without delamination) that, if the location of the reinforcement rod is known apriori, then it can be easily checked by impact echo testing that whether any delamination has occurred. For simulating the voids, various concrete blocks have been cast separately, containing cylindrical voids in it, and kept in the mold of the mock up block before pouring the concrete. All the voids are cylindrical in dimension with equal diameter and length, and the flat surface was kept facing towards the surface on which impact echo testing was carried out. Figure 4b shows the response of the void of 200 mm diameter at a depth of about 500 mm. The impact echo response is dominated by a sharp peak at 4.4 kHz (449 mm) in frequency spectrum, which is in very good agreement with the actual depth. Similarly the 100 mm diameter void at the depth of 500 mm could also be detected clearly. But the 50 mm diameter void at the depth of 500 mm could not be detected. To find out the depth at which the 50 mm diameter void could be detected, another test block (block-II) was made. In this block, 50 mm diameter voids were kept at various depths such as 100 mm, 200 mm and 300 mm. The void could be detected at 100 mm and 200 mm depth, but could not be detected at 300 mm. The response of the voids of 50 mm, 100 mm and 200 mm diameter at various depths exhibited that the voids can be detected, if the ratio of the depth to the lateral dimension of the void is less than 5. Fig 5: (a) Experimental setup and (b) waveform for depth measurement of the surface opening crack of depth 50 mm. Where CP, -t and H are respectively the P-wave velocity, time lag and the constant distance between the crack and the transducer 2 (H2)(= the distance between the crack and the impact point (H1)). Using this equation, the depth of the crack was found to be 54 mm, which is very close to the actual depth of the crack (50 mm). Similarly the depths of the surface opening cracks of depth 25 mm and 75 mm could also be determined with an accuracy of " 10 %. Based on the optimized test parameters identified with the help of studies carried out on the mock up blocks, impact echo testing was carried out on the ring beam of the containment structure of the nuclear power plant. Before carrying out the examination for detection of flaws/anomalies, velocity measurements were carried out on the ring beam at many locations along the circumference on outside surface as well as inside surface of the ring beam. For velocity measurements, double transducer technique, as discussed earlier (Fig. 2), was used. The velocity value was found to be consistent with maximum scatter of " 100 m/s and this measured value was used for further testing. The test has been carried out at different sectors in the ring beam suspected of getting damaged due the delamination of the dome and also on good regions for comparison. The selected regions were divided in to grids of 500 x 500 mm and the impact echo tests were carried out within the grids at closer intervals for checking repeatability and comparison at different locations and the representative data for each grid was stored in the computer. The ball of 10 mm size was used for giving impact to ensure full penetration of the ring beam wall. The steel ball of 4 mm size was used to test the delamination of the reinforced rods since the circumferential and vertical rods are at a depth nearer to the test surface. The velocity measurements at all the measured locations on the ring beam showed consistent value of 3800"50 m/s. Initially the impact echo testing was carried out at several locations on the ring beam where the circumferential and vertical reinforcement rods are present, By analysis of the spectrum, it was possible to detect and locate them. The values obtained by impact echo testing were found to be in agreement with the drawings. Figure 6(a) shows the presence of a cluster of peaks at 17.1 kHz in the spectrum of a signal acquired on the ring beam, when a 4 mm dia. steel ball was used for giving impact. It can be noted that the frequency spectrum is similar to that in Fig. 4(a), which is the typical response of a reinforced steel rod. As discussed earlier, applying equation 2, the depth of the 28 mm diameter reinforced rod was calculated to be 70 mm. The depth and location of the rod matched with the actual location as per the drawing of the ring beam. Figure 6(b) shows the presence of a sharp peak at a depth of 213 mm (8.5 kHz.) in the spectrum of the signal acquired at one of the places on the ring beam, when 10 mm dia. steel ball was used for giving impact. It can be noted that the frequency spectrum is similar to that in Fig. 4(c), which is a typical response from a void. The drawing of the ring beam confirmed the presence of a duct sheath of diameter 85 mm at a depth of 213 mm. (The duct sheaths also give similar response as the voids (Mary Sansalone and Nicholas J. Carino, 1988)). The confirmation of the presence of reinforced steel rods and the ducts by the drawing of the ring beam has given confidence in the methodology of the impact echo testing for detection of defects and anomalies in the ring beam structure. Fig 4c: Response of 200 mm void at 450 mm depth in mock-up block-1. The evaluation of the collected impact echo data has not shown presence of any cracks, voids, delaminations, honey comb etc. Figure 6c shows a typical frequency spectrum obtained from the ring beam giving full thickness. It can be seen from the Fig. 6c that the absence of prominent peaks other than the peak corresponding to backwall (reflection from full thickness) confirms that the region tested is free from any defects/ anomalies. Fig 6c: Response of full thickness in ring beam. The paper discusses the studies carried out to establish the feasibility of detecting various types of flaws, viz. voids, delamination at reinforced rods, depth of surface opening cracks etc. in concrete structures simulating the ring beam of PHWR containment structure, using Impact-echo technique. It has been found that a void can be detected, if the ratio of its depth to the lateral dimension is less than 5 and a reinforced rod can be detected if the ratio of the depth of location to the diameter of the reinforced rod is less than 3. It can be easily checked by impact echo testing that the reinforcement rod is delaminated or not. Further, the depth of the surface opening cracks can also be determined with an accuracy of " 10 %. Based on the optimized test procedure with the help of the study on the mock up blocks, impact echo testing was carried out successfully on the ring beam of the inner containment structure of a pressurized heavy water nuclear reactor. The results of velocity measurements and impact echo testing revealed that the ring beam was free from any defects/ anomalies. Authors would like to thank Dr. Placid Rodriguez, Director, Indira Gandhi Centre for his constant encouragement. Authors are also thankful to Shri V.K. Sharma, Project Director, Shri P.S. Subramaniam, ACE, QA, Shri. M. Suresh and Shri. A. Kamath, NPCIL, KAIGA, for making the mock up blocks and for many useful discussions. 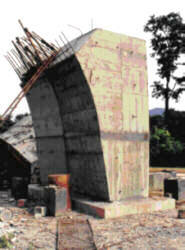 Anish Kumar, M.Thavasimuthu, and T.Jayakumar, "Examination of Concrete Structures for Detection of Defects using Impact Echo Technique" Proceeding of NDE 98, Trivendram, India, 1998, pp 54-57. Anish Kumar, T. Jayakumar, C. V. Subramanian and M. Thavasimuthu, "Testing of Concrete Structures for Determination of Strength and Detection of Flaws using Low Frequency Ultrasonic and Impact Echo techniques", J. Non-destructive Evaluation, Vol. 19 No. 2, 1999, pp43-46. Carsten Henriksen, Impact-Echo Testing, Concrete International, May 1995, pp 55-58. C. Cheng and Mary Sansalone, "The Impact echo response of concrete plates containing delaminations: numerical, experimental and field studies", Materials and Structures, 26, 1993, 274-285. Chia-Chi Chang and Mary Sansalone, " Effects of Impact-Echo signals caused by steel Reinforcing Bars and Voids around bars. "., ACI Materials Journal, Sept-Oct. 1993, pp 421-434. Jiunn-Ming Lin and Mary Sansalone, "The transverse elastic impact response of thick hollow cylinders, J. Nondestructive Evaluation, Vol. 12 (2), 1993 pp 139-149. Mary Sansalone and Nicholas J. Carino, "Detecting honeycombong, the depth of surface-opening cracks an dungrouted ducts", Concrete International, April 1988, pp 38-46. Mary Sansalone and Nicholas J. Carino, "Detecting Delamination in concrete slabs with and without overlays using the Impact-Echo-method. ", ACI Materials Journal, March. April 1989, pp 175-183. Mary Sansalone, "Impact-Echo: The Complete Story," The structural Engineering Journal of the American Concrete Institute, 1995. Operation manual for the DOCter Impact-Echo test system using the Echo Blue software, March 1996, Germann Instruments A/S, Emdrupvej 102, DK-2400 Copenhagen, Denmark.